Channel head Steve North expresses the station's utter delight. Imagine being Steve North. Over a decade after Red Dwarf left British screens, his was the channel that would bring the show back to audiences. But would that audience find the show? Would Dave's former existence as a 'repeats channel', or its decidedly non-terrestrial existence, hurt the show's chances? Would Red Dwarf's time away dampen enthusiasm for the sci-fi comedy's antics? If the channel head was ever worried, he never let it show. In fact, this would seem to be the ideal match of broadcaster and content. 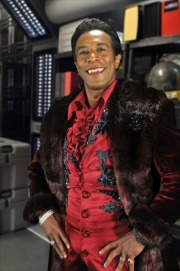 "Red Dwarf has always been very much at the heart of the Dave schedule," he tells reddwarf.co.uk. "It's one of the most popular programmes, most popular sitcoms, we have on the channel without a shadow of a doubt. 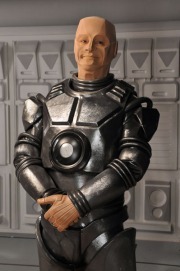 So we were discussing the 20th birthday and it was an absolute no-brainer because the fans of Dave all love Red Dwarf, and Red Dwarf has such a big fanbase - why wouldn't you try to do a celebration for its birthday? And that's where we kicked off." That may have been the start, but things sure did change along the way. "When we started talking... we were [talking about] having a celebration for the 20th birthday and maybe doing some clip-based shows or some short interstitials introducing some episodes across a weekend." That plan evolved swiftly, with even talk of an 'unplugged' show featuring new performances of classic comic scenes. But, in the end, Doug Naylor went for the gold. "We never thought we'd have three brand-new half-hours, that was way beyond our dreams. We'd never commissioned a sit-com before, so for this to be our first one was amazing." To go from UKTVG2 to Dave, to making new top-rated content is a huge achievement - "It's been an amazing roller-coaster," Steve admits. 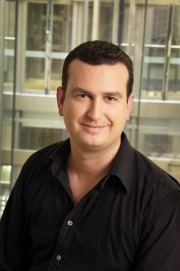 "Taking a channel with a 0.4% share of the market to a channel that last week took a 1.7% share of the market is an enormous growth from where we've been. And then to launch a show like Red Dwarf and command an audience of 2.7 million is something that we can only have dreamed of." That result - as much definite plan as daydream - is probably partly down to just how well the station's goals and status suited that of the show they were making. "Red Dwarf would have worked wherever it went, [but] I like to think that it being on Dave is the right home for the programme. Because it just feels right... The two things combined - to be w**ky about it - have that 'synergistic' ability of two plus two equalling five. That together they are more than their individual parts." The same can be said of Red Dwarf itself, of course. A show too quickly dismissed as 'cult', it was always a mainstream show with an audience to match. The SF element may cause the term 'fan' to be misunderstood - a fan of The Office, for example, is someone who watches the show regularly. Not the forum-dwelling, costume-wearing, humourless cliché of myth. "It's very easy to look at Red Dwarf and just think 'it's a sci-fi show, it's very niche' - but actually it's far more than that... It's the writing, it's the characterisation - and the acting - that makes it the success it is. You could take a lot of the writing, I'd expect, from Red Dwarf and put it into a completely different scenario and it would still be funny. Because it's just that funny a show." Thankfully, when the Dave press and publicity team began to approach the news outlets with press releases, interviews and pictures, they found the response to be hugely positive - from the tabloids to The Times, everyone gave the show coverage. "It was... 'easy' is the wrong word, because it was an enormous amount of hard work, but there was such a positive response to everything we did that it was just amazing. Everybody was talking about it, everybody knew about it. "You never quite know, you never know how a thing will be picked up on. But every element that we did, there was such a positive response to it. We ran the [Artificial Reality] Game, about the guys coming back to Earth, with our big reveal in Berkeley Square with hundreds of fans turning up - which was fantastic. And the amount of people we had involved with that game was huge." But there came a point where the campaign was almost too successful. The preparation of mass gatherings to watch the new shows might be great for the viewer, but it caused a small panic at Dave. "We were getting worried up towards broadcast because we started getting people saying 'We're having a Red Dwarf party at my house, I've got 30 people coming round', 'We own a pub and we're going to put it on the TV and open it up'. And we're going 'No, no no! everyone stay in your own house! No pubs, 'cos there's no BARB ratings for that! Everyone stay in your own house, watch it separately on as many sets as possible!'" Steve laughs - which, after the ratings came in, he can afford to do. "The fact that we had 2.7 million viewers - I'm sure we had more than that in reality because there were all these Red Dwarf parties going on!" Around the country, the level of interest in the build-up to broadcast was extraordinary. "And not just in the UK - we were getting emails from America and Europe saying, 'Are you going to put it on the website? Can you do simulcasts? Because we want to see as well'." And then there came the ratings. Gobsmacking was hardly the word. "We always thought it could be a really successful show for us. Because of its heritage - if you look at the last episode on BBC2, eleven years ago now, which pulled in an audience of eight million viewers. So you sit back and go 'I know it's eleven years later but the likelihood is that most of those eight million are still around, there's got to be a decent proportion who'd love to see some more'." And the result? Biggest UK show ever on digital TV. Highest-rated commission on multi-channel ever. Second-highest multi-channel show ever. It's a huge step forward for a channel that can't rely on the support of a terrestrial sister station to pump up the numbers. Where BBC3, E4 and ITV2 can all promote on their larger counterparts, Dave stands with the UKTV channels as part of a Freeview island chain, with no direct ties to the mainland of terrestrial. "To generate that audience completely by yourself is incredible. And, I think, reassuring for the TV community as a whole, actually, to show that if the project's right and the show is good enough, [that] you can still get a massive audience to a show. Because it's easy to go down that old [route of] 'TV's fragmenting, mobile, web, people don't watch TV in the same way, nobody watches it on the sofa'. Actually, if the project's right, yes you can do that. It's hard but you can do that. And you can do it without having to promote it off the back of Eastenders. That gives great confidence to us, and should do to other broadcasters as well." Since Dave became Dave, the aim has always been go go beyond being a repeats station, to push into new shows. And Steve's clearly thrilled by what the success of Red Dwarf means for the channel as a whole. "We based the channel on this idea of being slightly smart, slightly intelligent and irreverent, so pushing the boundaries. And to do that we needed to be producing our own content. So our intention was always there to have that level of origination - what Red Dwarf has done is given us the confidence that we can make programmes that cut through with big audiences. "The other thing I think it's done for us is it's also shown the production community that Dave can be a home for their content. There's no doubt that we've seen an increase of ideas coming through, in both quantity and quality. People who want to work with us and share their ideas, and that's fantastic and very encouraging for us. I think we're now seen as being an creative outlet, if you like, for comedy, and content in general - up there with Channel 4, BBC3, ITV2 and Sky, maybe. Dave is, I think, now on that list, because it's a place where they think their content can find a home, find a voice, find an audience." So let's ask the big, obvious, GELF-in-the-room question: where does Red Dwarf stand with Dave at the moment? "Well, Red Dwarf's still very much at the heart of our schedules. It's on pretty much every week. Red Dwarf is still a really important brand to us. We're all delighted with how the new shows have gone, how they've performed for us, and the relationship that we've built up with the guys. "As to whether or not there'll be any more Red Dwarf to come, who knows? It's obviously something we'll have a look at and we'll talk to the guys about and we'll wait and see. But I think any fans out there should keep their eyes peeled to Dave for the future." Is it true to say say Dave want a new series and meetings have taken place? Is it also true to say a new series has actually been commissioned but for various complex budget reasons you aren't able to officially announce it yet? Steve laughs, "I couldn't possibly comment." You can peruse the Dave website at joindave.co.uk.